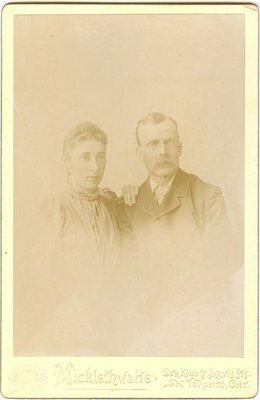 A photograph of Geo & Annie Dibb from the photo album belonging to Margaret McCague Wright and her husband William Ashford Wright. Frank W. Micklethwaite is listed as operating photography business in Toronto, corner King and Jarvis Streets in ca. 1881-1894. The inscription on the back of the photograph mentions the Industrial exhibition in Toronto in 1893. Cor. king & Jarvis Sts. Toronto, Ont. Cor. King & Jarvis Sts.